One We’ve had some gloriously sunny days but the late afternoons and evenings have been icy-cold this week. Winter is reminding us that it may yet come back to bite us on the bum. I read a tip on Gillian’s blog for cleaning the glass windows in wood burners: screw-up some newspaper, wet it, dip it in ash from the fire, scrub the window and the soot comes away easily, give it the once-over with some dry scrunched-up newspaper and Bob’s your uncle. It worked a treat. The sight of the first fire after cleaning was so clear, it looked as though there was no glass there at all. 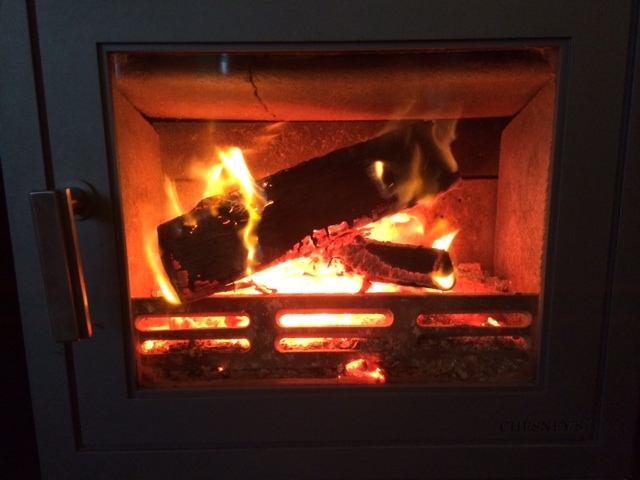 It feels all the more toasty when you can clearly see the flames flickering around the wood. Two I’m off the starting block with the crochet. Woohoo. 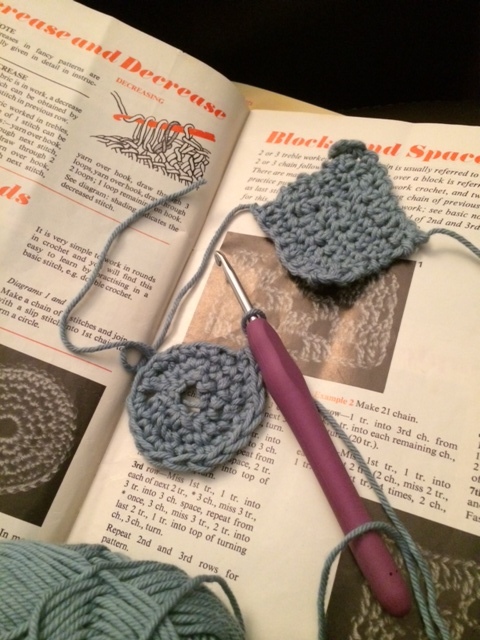 I’ve managed a little square and a little circle of double crochet, which was the source of much amusement (Look! It’s a hat for a guinea-pig! ), and now I’m doing a little piece of half treble. I’ve discovered that it’s much easier if you can see what you’re doing, so wearing my reading glasses and sitting by the window help enormously. Now I’m getting the hang of it I can see how it could become addictive. It’ll be a long while before I’m up to blanket-speed, though. Three David’s 50th birthday present from me was a day on an advanced bread-baking course at the E5 Bakehouse last Sunday. He had an absolutely brilliant time and came home even more fired-up about bread. I’d say he’s on the verge of being a bread evangelist. He will talk bread with anyone who’ll listen. 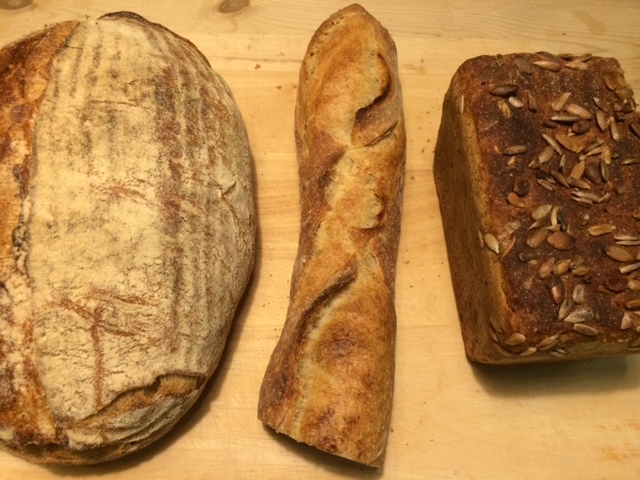 I’m on the verge of being bored by bread (bludgeoned by baguette) but that would be churlish when he’s turning out such scrumptious loaves for us to eat. Four My brother and his family came to stay for a few days. I do so love spending time with them and seeing our children together. There’s quite an age gap but my little niece and nephew adore their big cousins and my three are lovely with them. My sister-in-law, who is an all-round super creative person (web designer and photographer) has been helping me get my head around a website for my editorial work and she’s very kindly taken some photos of me. I’m definitely not a natural in front of the camera and it’s a testament to her skill that there were a few decent ones out of all the photos she took. She’s going to do some tweaking before I use them. Five Did I mention the bread?! 🙂 Back to the Howard Jacobson quote at the end of my previous post. Uncertainty is my default state of mind these days. My 16-year-old sees pretty much everything in black-and-white but the older I get, the more I see that the world is a big mush of grey. The only thing I am certain about is my love for my family, that the sea will be outside the window tomorrow morning and the dog will be pestering me for her walk if she hasn’t been out by 10am. Wishing you an excellent weekend. I shall be catching up with a mountain of laundry, ‘encouraging’ the children to do their half-term homework before Monday and hopefully getting out into the garden – the greenhouse needs clearing out and there are sweet peas to sow. Spring is in the air. I’m joining in with Amy’s popular Five on Friday link-up which has been running for one year today, linking many bloggers from around the world. Lovely to make your acquaintance though 5onFri. I envy a log fire – one-day. 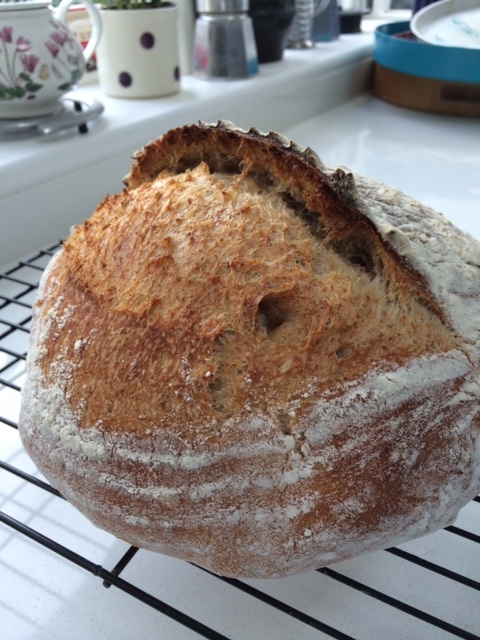 I am also very envious of your Davids breads, I would love to oneday attend a breadmaking course, David’s breads look absolutely fantastic. Nothing beats homemade bread, sadly mine is made by a bread machine. He’s getting quite good at turning out a few loaves at a time. We are being spoiled for bread! It’s that exciting time of year – seed-sowing! Congratulations on getting started in crocheting. I love home made bread, but I’m a bit lazy, I use a bread machine. oh it is time to sow sweet peas? must do that! I did my greenhouse tidy already, the rest of the garden, mmm well we won’t mention that……. I put my sweet pea seeds to soak yesterday. 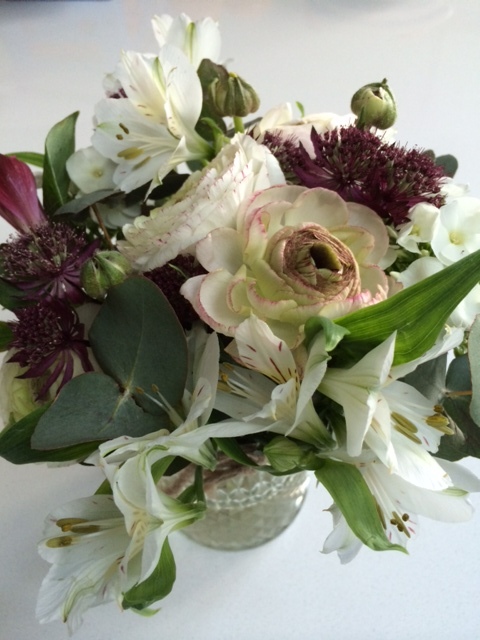 I’ve not done this before but I’m following the advice of Julie at Peonies and Posies. I’m afraid my sourdough starter died. I neglected it due to cottage renovation. I will try again when I’ve got more time and energy. Your crochet looks very good. I only taught myself to crochet in November 2014 and the first item I made was a cot-sized blanket which I throw over the back of a chair. Maybe you could turn your circles into squares and make a cushion cover? Have a good weekend before the Monday back to school rush. I’ve not soaked sweet pea seeds before. Interesting. Not sure about the crochet! I’m still very beginner. Having not picked up the crochet for about a week, I’m sure I’ll be a dipper-in too, which is one of the reasons it’ll take me an age to make anything! I’m with you on the Jacobson quote. As I get older, the world has transformed from black and whitish to endless shades of gray. I’m a bit distrustful of people (aside from 16 year olds) who view everything as black and white/right and wrong/us and them. I make all our bread so I’d love to hear more about your husband’s experiences. I bought a Paul Hollywood book (old) just before Christmas and am working my way through it trying everything. I decided to do that as I have so many cookery books and so it was a justification for buying another. The bread looks wonderful. I enjoy making bread, but it takes a long time if you do it the proper way. Strictly for weekends, I’m afraid! We are being spoiled rather by all the lovely bread. Don’t get me started on slugs and snails..! Laundry mountain now a small hillock. Hope yours is too. Ooh, sounds lovely. Hope you had a good time. Woohoo for the crochet. The world is your Granny Square. That bread looks like the answer to all my wishes. I’m working up to a granny square! We’ve had such a warm winter that the fire hasn’t been on much at all. Will have to check to see if the fireplace doors even need a cleaning … thanks for the tip! Those are amazing loaves of bread! Yummy 🙂 Love the bouquet of flowers, they look like an old painting. brilliant was to spend a winter’s day. I do love fresh baked bread. Your husband is welcome to come over here and lecture on bread qw long as he bakes us some. I’m sure he’d love to!